The PolyScience 300 Series chamber vacuum sealer is a well-crafted product with a versatile, durable, and reliable design. 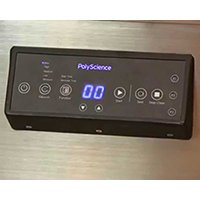 Normally specializing in sous vide-focused appliances, PolyScience has stepped up its game by manufacturing this innovative vacuum sealer. Quick and effective, the PolyScience 300 chamber vacuum sealer works on both edible and non-edible items. Its easy-to-use control panel allows for quick toggling between sealing functions and the built-in marinade option provides flavor-infused meals with every use. In this article, we’ll be reviewing every function, ability, and accessory that PolyScience 300 has to offer. We’ll be look at why customers have been raving about its external vacuum port and dry piston pump. After reading this, you’ll know exactly how and why you should make this chamber vacuum sealer a permanent kitchen essential. The PolyScience 300 is a one-of-a-kind appliance built for high-usage food vacuum sealing in either commercial or home settings. Featuring a maintenance-free dry piston pump, this chamber vacuum sealer can save you time, energy, and money by extending food shelf-life. With a sturdy, yet attractive, stainless steel casing, the PolyScience 300 is a gorgeous appliance that can complement any kitchen. A truly versatile product, its external vacuum port is perfect for sealing cans, zip bags, containers, and jars. Not only that, but this commercial vacuum sealer can seal non-edible items such as documents, jewelry, energy supplies, and birth certificates. The chamber vacuum sealer’s dry piston pump is a lightweight, cheaper option compared to the common oil pump. Built for a home kitchen setting, it doesn’t require maintenance and can guarantee up to two-dozen consecutive seals without overheating. This is perfect for quickly marinating multiple flavorful meals. It utilizes the high-pressure suction of the chamber vacuum sealer to infuse liquid and flavor into meats, vegetables, and fruits. It’s also a handy option for sous vide cooking. This insures a quick and reliable, airtight seal with every use. It’s perfect for sealing jars and canisters. At 55.5 pounds, the PolyScience 300 chamber vacuum sealer is both a large and heavy appliance. This could provide difficulties when storing or transporting the vacuum sealer. Despite its size and weight, this chamber vacuum sealer works smoothly and quietly when sealing various food items. These items include fish, beef, chicken, fruits, vegetables, and tofu. The PolyScience 300 does not include an internal bag-cutter. Instead, you can purchase bag material and cut it to size with scissors. You can also purchase pre-cut pouches that are cheaper and easier to use than bag material. Both bag material and pre-cut pouches can be bought online or in-store. This chamber vacuum sealer is built to be paired with PolyScience brand reusable vacuum sealer canisters. These canisters are Bisphenol A (BPA)-free and are covered by a 1 year warranty. Dishwasher-safe, they come in single packs and can hold up to 2.5 quarts. You can purchase a PolyScience Resusable Vacuum Sealer Canister via Amazon.com. Just follow this link: PolyScience ﻿﻿canister. The PolyScience 300 chamber vacuum sealer comes with a handy starter kit that includes (1x) pint vacuum sealer bag, (1x) quart, and (1x) gal. Amazon offers a 3 year protection plan for those who purchase the PolyScience 300 chamber vacuum sealer via Amazon.com. The PolyScience 300 chamber vacuum sealer has an average consumer rating of 4.6 out of 5 stars on most third party websites. Unfortunately, I could only find a total of six customer reviews. However, all of the reviews seemed to praise the same things: the external vacuum port and the pre-programmed commands. The pre-programmed commands are convenient and time efficient. It makes sealing and preserving your foods and precious items a stress-free, one-touch process. Common complaints about the PolyScience 300 Chamber vacuum sealer tend to revolve around its weight and size. At 55.5 pounds, this chamber vacuum sealer is both heavy and bulky. It does take up quite a bit of surface space in your kitchen. However, its large casing and thick build supports its durability, while the sleek, stainless steel casing can complement any surrounding. The PolyScience 300 series chamber vacuum sealer is an impressive kitchen appliance. Capable of sealing 12-24 bags without overheating, it can extend your food’s shelf-life by at least 5x. Sturdy and reliable, it’s perfect for marinating meals and at-home sous vide cooking. Not only that, but it can preserve and protect your precious family heirlooms. Is there nothing that the PolyScience 300 can’t do? Albeit a bit pricey, the PolyScience 300 is guaranteed to provide you and your family years of healthy, tasty meals. If you’ve enjoyed this article, please post a review. Have you purchased the PolyScience 300 before? If so, than did you enjoy it? How did it work? Would you recommend purchasing a PolyScience 300 series chamber vacuum to your friends or family? Let us know !